Churches Trust for Cumbria | Keeping local church buildings alive by providing advice on care, conservation, development and sustainable use of Cumbria’s church buildings. Looking for a church to visit over the Easter Break? The Churches Trust for Cumbria, Cumbria Tourism and ExploreChurches are working together to promote Cumbria’s sacred church heritage. What are the ingredients for a viable church? Come and join us with a range of national and professional speakers at our free workshops and information days, 9.30 – 3.30pm lunch included. 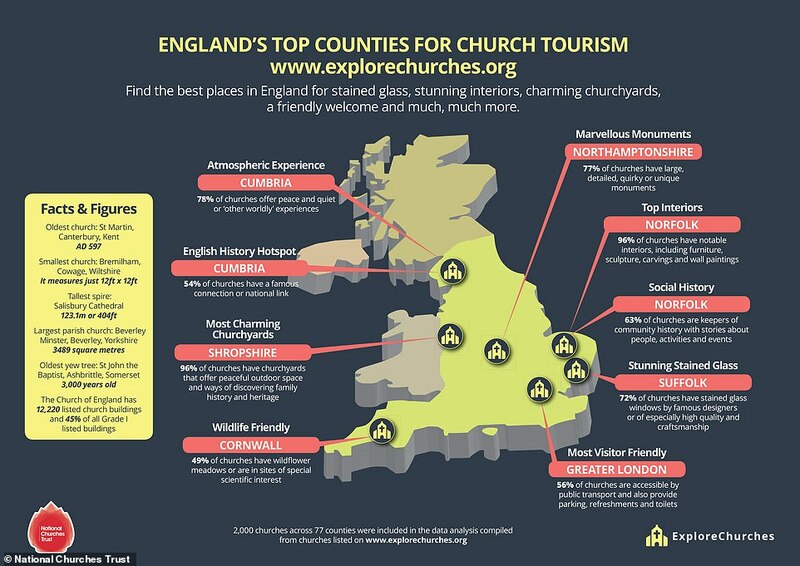 1st May at Penrith Methodist Church – Michael Murray Deputy Chief Executive, National Churches Trust – New Funding strategy, ExploreChurches and MaintenanceBooker. 15th May at St Aidan’s Cafe, Barrow – Kay Short, Ecclesiastical Insurance – Church security and safety and Bruce Mumford, Technical Advisor Heating and Lighting. 22nd May at St Michael, Workington – Kay Short, Ecclesiastical Insurance – Church security and safety and Bruce Mumford, Technical Advisor Heating and Lighting. The Churches Trust for Cumbria has received a National Lottery Heritage Fund grant of £75,400 for an exciting heritage project, Caring for Cumbria’s Churches. Made possible by money raised by National Lottery players, the project focuses on improving the sustainability and resilience of church buildings across Cumbria. The project will provide those who care for our church buildings with training and skills to better manage these unique buildings. It also aims to realise the potential of church buildings as community assets and raise their profile as places of valuable heritage interest. Supported through the National Lottery Heritage Lottery Fund (NLHF), the 18 month, ecumenical project will enable those who care for church buildings to improve their maintenance, and develop a long-term strategy for their sustainability and resilience. A series of videos will explore their potential as places of worship, heritage and community assets and help us to better understand these unique ‘living’ buildings, in order that they remain for future generations. The series of videos will be produced by specialist TV production company Brilliant Trees Media who have strong links with the region. CTfC will be hosting a series of workshops, three in May and three September in the north, south and west, I will confirm dates and locations in due course. I am also looking for churches to pilot a building Inspection template to help with maintenance. Please get in touch with me if you would like to help, or I will be attending the God for All Big Discussion on 1st March – come and say hello. The Heritage Lottery Fund have from 29th January adopted a name changes and will now be known as The National Lottery Heritage Fund. Along with the new look they also have a new 5 year strategy and a new approach. The changes are to make a clearer link between playing The National Lottery and the good causes that benefit and they come in The National Lottery’s 25th anniversary year. Below is a brief breakdown of their new grants. The National Charitable Grants list has been updated. The list provides practical information on potential sources of funding for various church related projects and is available on the Parish Resources website (or you can download it by clicking here). It is worth noting that this is a national list, and therefore contains no information about local funders. It is also a large document if you are printing it. These are some of simplest but most effective jobs that can be done as they require very little specialist equipment, and yet if undertaken regularly, they can save the parish a fortune in repairs. However, as with any maintenance work, always ensure that several people are present on site to hold ladders steady, and follow all health and safety guidance. Gutters, hopper and downpipes can easily become blocked with fallen leaves, sticks and weeds through the year, particularly during the autumn. It is also not unheard of for birds to choose wide gutters to nest in and once abandoned, whole nests can wash along and block outlets preventing rainwater from clearing. Cracks and splits in gutters, downpipes and hoppers can be caused by wear and tear, movement or by water freezing during very cold spells, and these can also cause problems. If the rainwater goods become blocked or broken the water will overflow, running down the side of the building, or in the case of parapet gutters, it can back up and run over the top of the wall, saturating the eaves. Over time this can lead to the walls and roof timbers becoming saturated, plaster and paintings deteriorating, woodwork going mouldy and in the worst cases rot / insect attack can set in. The whole church will feel cold and damp, and these significant problems, which could easily have been avoided, will cost a great deal of money to rectify. Rainwater goods and their associated lead work should ideally be checked once a year for cracks, splits, holes, signs of water running down the walls (look for damp patches / green staining), missing / loose brackets and vegetation growth. It is best to do this on a wet day if possible as any leaks will be more obvious. Small repairs / replacement sections of gutter can be sorted out quickly before they cause a problem, and as they are relatively minor, the costs will be minimal. As well as this visual inspection, the rainwater goods should be accessed via ladders or a cherry picker, (being aware of health and safety at all times), and all debris cleared out carefully to allow the rainwater to flow freely. Once cleared, it is worth using a bucket / hose / watering can to pour some water through to check everything is clear. In areas where there are large numbers of trees or where access is difficult, consideration can be given to covering open gutters and hoppers with chicken wire to allow the water through but to keep most of the leaves out. It is also important to look at the drains at ground level to see if the water is draining away. If they are blocked by leaves / rubbish / vegetation they will also need to be cleared. If the downpipe does not go all the way down into the drain, water can splash up making the base of the church walls wet. This can be a particular problem where there is no drain and water discharges into a gulley, so these also need to be cleared of leaves, grass and weeds regularly if they are to work properly and take the water away from the building. It is easy to remove small weeds from rainwater goods which are usually just seedlings blown in by the wind. However, when much heavier vegetation has taken hold within the stonework such as ivy, buddleia or valerian this will require a little more effort to eradicate it. Large expanses of vegetation should be carefully checked for bird’s nests before any removal is attempted. The most important thing is not to just try and pull it off the walls / gutters as it will take the mortar out of the joints leaving you with re-pointing to do as well. If possible cut the plants off at their base right through all stems. The plants (both the main part and the base) should then be sprayed with a suitable weed killer (on a dry calm day following all health and safety instructions), and then be left to go brown and die off on their own. If the plant has waxy leaves like valerian, a small amount of washing up liquid added to the weed killer will allow it to stick to the leaves rather than simply running off. It will take a few weeks for the plants to go brown and die off and they may require a further application of weed killer especially if the weather has been wet. Although it will not look attractive as it goes brown, please leave it alone. Once it has completely died off it will have loosened its grip on the building and it can then be gently pulled off without disturbing the mortar joints. Large areas of ivy may actually come off in one go. It is then important to get the area of stonework that has been uncovered checked and re-pointed in lime mortar if necessary to stop water getting in through the voids the plant has made. These areas in particular should be carefully monitored so that if any vegetation starts to grow back, it can be tackled straightaway before it can take hold. Where weeds have become very large it may be necessary to seek specialist help / advice as the stems may need to be injected with a stronger weed killer. In the most serious cases, sections of walls may need to be carefully dismantled, the roots removed, and the wall rebuilt to prevent it coming back and to stabilise the structure. The National Charitable Grants list was updated in September. It is worth noting that this is a national list, and therefore contains no information about local funders. Due to economic factors, metal remains attractive to thieves. Ecclesiastical have put together a checklist to help improve the security of church buildings.